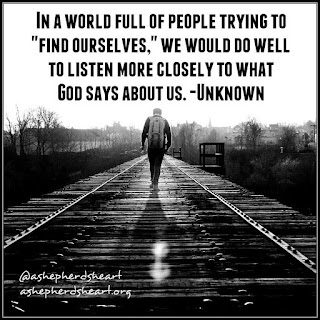 A Shepherd's Heart: Are You Listening to What God Says About You? Are You Listening to What God Says About You? Have you found yourself struggling to forge a path or find yourself struggling with self worth issues? Let me ask you - when was the last time you cracked open or dusted off your Bible, God's Word and read all He has to say about you and your relationship with Him? To read about His everlasting and unconditional love for you? In the pages of scripture you will see more about who you are as well as see that God loves you, He sent His son to prove it and in turn Jesus sent His helper, The Holy Spirit to help you navigate life! You need to know who you are and be confident in you're worth. There's no need to continue to follow the crowd wandering through life trying to find out who you are. Matthew 6:25-29 proves that He cares for your every need and values you more than anything in creation itself! If you didn't matter to Him...do you think He'd provide for your every need? Romans 5:8-10 proves that even before you knew Him, while in sin and where an enemy, He still loved you and reconciled you to Himself! Ephesians 2:8-10 shows you that He created you for a specific purpose...a purpose that He wants to fulfill in and through you! Do you see how significant this means you are? Or, would he have wasted time creating the work for you to do? Ephesians 1:13 & 2 Corinthians 1:22 shows that you are His and sealed and marked by the Holy Spirit of promise! You are significant, He's give you His Spirit to empower and direct you and He's set you a part which speaks again to how significant you are! These are just some of the many examples God has provided that speak to your significance. Now, there is a normal amount of growth that happens and some figurative figuring things out such as career path etc. But, you can't stay in that mode for long or you'll be like a plane waiting a long time to get the nod to taxi to the runway to finally take off or launch into the air! In many ways you already have access to the runway ahead of you and you have to give yourself permission to launch! You have a special purpose in life including special gifts and talents to offer and you have a full life to live...and God created you to live life fully walking confidence within a great purpose and plan! So, let me encourage to spend more time listening to what He says about you rather than following the pattern of this world...A world that just may be leading you into a perpetual cycle of delaying what it is that you are supposed to be doing to fully live the life you've been given! Don't allow anyone, anything, or your own limited or skewed view of yourself paralyze you from believing in who you are, who you are in Christ, as well as how capable you are do do many great things for His Kingdom and glory. The next time you see yourself in the mirror speak truth...His truth to yourself and cast out fear and lies...because you are worthy and of great worth! 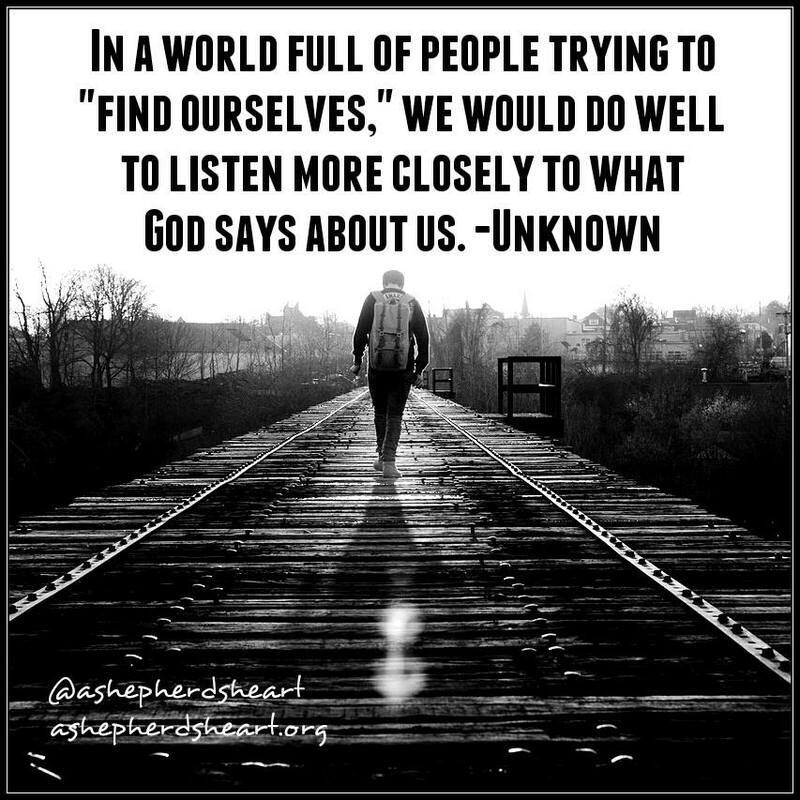 So, Are You Listening to what God Says About You or basing your worth on what other people say? The last thing you want to do is base your worth and existence on the shifting standards and opinions of others. You'll never feel stable or confident in who you are on a shifting standard. Instead, you need to base it on the never changing and unconditional truths of God's Word...because His truths come straight from His heart to your heart, mind and soul! I pray you figure it out soon...figure out that listening to His voice through His Word matters more than anything or anyone else's opinion in this world!